The photograph above is a good one of what was basically the home of the Scottish Cross-Country Union Championships from 1926 – 35 and again from 1950 to 1968. It is atypical in that the sun seems to be shining and the lush, apparently smooth green grass gives the impression that the competitors were running round parkland similar to Rouken Glen, Dalmuir Park or on other similar surface. What you can see is the long, fairly steep drags up in each direction: you always seemed to be slogging your way up a hill – like Hugh Forgie after running the undulating third stage of the E-G – and ‘never finding the downhill bits’. In addition the lush green surface was tough grass meant to withstand the punding of metal-shod horses hooves and pretty heavy going. At times they took the trail down and along beside the Clyde, but it was almost always confined to the racecourse. 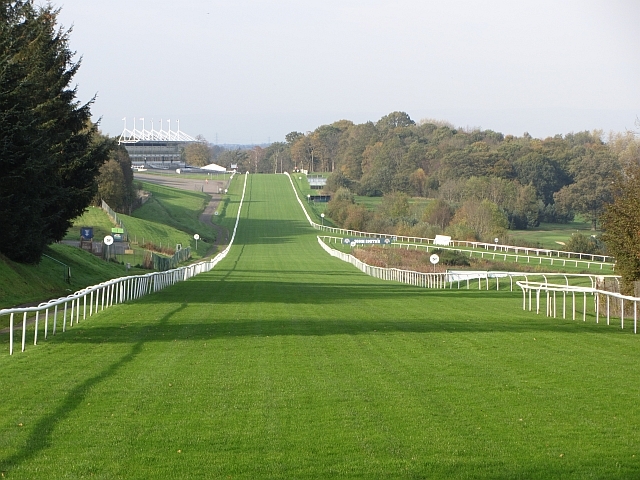 You started at the stands (at the top in the distance in the picture) and ran or charged downhill towards the cameraman and straight up the hill in front of you, before swinging round to your left and back down to join the straight at the second opening on the right above. Back up past the stands, round a wee loop to the left and back down to the stands, repeat three or four times. It was ferociously had going and all age groups (boys, youths, juniors and seniors) ran it. Despite the absence of fences, burns and any other obstacles to progress it was the hardest national run in my lifetime. The Dragon Hill at Irvine, fearsome as it is, came nowhere near as hard as the loing drags and hills of Hamilton. Naturally there were some hard, hard races there and two in particular stand out for me. The first was the battle between Graham Everett and Alastair Wood in 1960 and the best ever Junior championship in which Mel Edwards defeated Ian McCafferty in 1964. The first took place on 5th March 1960. Although Wood (13 January, 1933) is known as an Aberdeen man, at this point he was running for Shettleston at that point and had best times of 4:10.3 (Mile), 8:46.4 (two miles), 13:42.2 (three miles), 14:15.2 (5000m) and 28:40.8 (six miles) in 1959. The two and six mile times ranked him number one in Scotland. Everett (20 January, 1934) was a lifelong Shettleston Harrier and one of the best milers Scotland had produced. He had best times in 1959 of 1:54.1 (880y), 4:06.0 (Mile), 8:50.3 (two miles) and 14:26.1 (three miles). Wood was reigning SAAA champion at three and six miles while Everett held the SAAA Mile. They were both particularly good and strong runners who were in fine form. They had great respect for each other – when I asked Graham several decades later who was his toughest opposition in Scotland he replied that over the country it was Alastair Wood. The race at Hamilton was a hard, hard race with Everett going out really hard and only Wood able to stay with him. By half distance the pair were well clear of the field and Wood took the lead and the pace was maintained with each man fighting to win the title. Wood held first until they were into the last mile, out of the big loop and into the long (one and a half miles) heavy grassy trail which had been made even heavier by the races held already and the big field having trampled it several times. Into the last mile and Everett got in front and was never headed, opening a gap of five seconds by the finish. Third placed Andy Brown was 500 yards behind. Colin Shields in ‘Whatever the Weather’ tells us that in the weeks before the race, the winner had won two races at the Shettleston winter track meeting – 1000 yards in 2:18.2, and 3000m in 8:49.0. It had been a great race with the winning time being 47:15. 29th Feb 1964 was the date of possibly the best cross-country race I ever witnessed. It was the junior championship and a quite superb field contested the race. Who was running? Ian McCafferty of Law and District (4:16.0 Mile, 9:00.2 2 Miles, 14:36.4 3 Miles in summer 1963), Lachie Stewart (14:36.0 3 Miles, 30:01.8 6 Miles, 10:11.2 steeplechase), Mel Edwards (1:56.5 880 yards, 4:14.9 Mile, 14:40.0 3 Miles), and Alex Brown (4:20.9 Mile, 9:09.4 2 Miles, 14:04.8 3 Miles). A really very good field indeed. There might have been 75 yards at the finish but it had been a hard race, a great one to watch with Mel nevertheless looking invincible throughout. I watched the race while jogging about with Irish runner Cyril O’Boyle and we talked about it at length on the day and at training the following week. Edwards looked like a movie star, he ran like a thoroughbred and was moving as smoothly at the end as he was at the start. Remember – we are talking of McCafferty and Stewart running behind him … and Alex Brown, and Joe Reilly and 88 others who labouring in the vineyard of cross-country running. It would have been a great race to have on video.